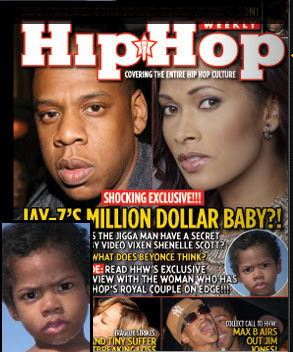 Former Source magazine owners David Mays and Benzino claims to have proof behind Jay-Z's "love-child" rumor .According to Ballerstatus.com, Hip Hop weekly has obtained proof that Jay Z pays the alleged mother of his child $4,000 a month in child support. I mean couldn't they have picked a better picture of Jr.
Why does Benzino and Mays gotta be in another grown man,s business?While their business failed considerably. You are so right Jahmodi. I don't like that ish either. The child does look like Jay Z, but hey, he can just join the club with the rest of the entertainers who pay child support. It's not a big deal!! The baby looks just like him please!!!!!!!!!!!!! Beyonce needs to select a better partner, I like Jayz and his music but to pay the mother of your child not to claim you as a father tells a lot about his character. He may be a mogul but he still is like most men, liar and cheat and that will not change with marriage.BEYONCE can do better and if she should marry Jayz will regret her life afterwards.